The Arctic is one of the earth’s most fragile ecosystems, dis proportionally affected by climate change and warming at twice the average rate of the rest of the planet. To garner global attention and support for the rapidly disappearing ice in the Polar regions, UN Environment is organizing the ‘last ice hockey game in the Arctic’ in spring 2019. The game is spearheaded by legendary Russian ice hockey player Viacheslav Fetisov, who was designated UN Environment Patron for Polar Regions this week. The frightening speed of climate change is particularly visible in the Arctic. This winter the temperature at the North Pole was well above normal. Ships navigated the Arctic Passage without icebreakers for the first time as the age, thickness and extent of sea ice cover in the Arctic decreased. The hockey game, to be played in spring 2019, will take place on an ice rink on the North Pole. The teams will include ice hockey players and sports personalities from around the world, as well as Arctic indigenous peoples and youth. The symbolic event is a wake-up call to the world, highlighting climate models projecting that the Arctic Ocean will be ice-free by 2040. During the event, the teams will phone the United Nations Secretary-General from the North Pole. Viacheslav Fetisov has frequently drawn attention to the polar region over the years; for example working towards the establishment of the marine protected area in the Ross Sea in Antarctica and orchestrating a massive beach cleanup in the Russian Arctic in 2017. 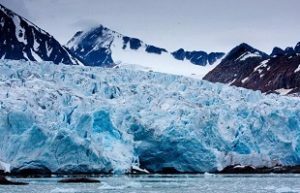 Changes in the Arctic affect weather patterns across the world with severe consequences for humans, societies, and nature. In light of this, Viacheslav will use his new position as Patron for Polar Regions to strengthen awareness of some of the most urgent environmental issues, including climate change, pollution, ocean protection, clean water, national parks and sustainable tourism. Fetisov is a legendary Soviet ice hockey player, one of the best defensemen in the history of world ice hockey. During his career, he won two gold medals at the Winter Olympics and was a two-time winner of the Stanley Cup with the Detroit Red Wings. In 2015, Fetisov was the first person in Russia to support the campaign to create the marine protected area in the Ross Sea, Antarctica. Throughout the years he has lent his support to several environmental initiatives in the region, including Lewis Pugh’s (UN Environment Patron of the Oceans) cleanup on Lake Baikal, Russia and the Antarctica 2020 campaign for the creation of more arctic marine protected areas. In September 2017, he orchestrated the biggest beach cleanup in the Russian Arctic.